Growing garlic from bulbils takes patience but can be very rewarding. Photo courtesy of Gardenisto.com. Garlic can reproduce in three different ways — from cloves, from bulbils, and from seeds — although by far the most common form of reproduction is by cloves. Each clove will produce a genetically identical garlic plant to its parent, giving it a quick and easy path to the next generation. Bulbs in the ground will naturally break apart each season, giving each clove a good shot at developing into a new plant. 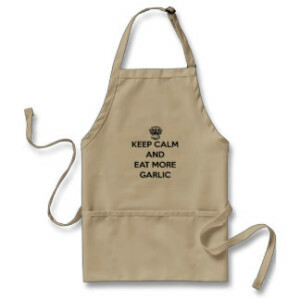 Like some other plants, though, garlic doesn’t limit its survival chances by relying on propagation by cloves alone. Most types of garlic will produce a scape each year, which will typically develop both bulbils and seeds if left on the plant. Growing garlic from true seed is very difficult — but not impossible — but growing garlic from bulbils is quite easy with a lot of patience and a little planning. Bulbils are similar to cloves but a little more primitive. You plant them in a similar fashion to when you’d plant garlic cloves — usually in the fall — but they take much longer to develop into mature garlic. 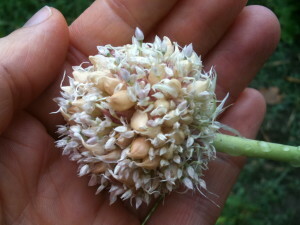 Garlic bulbils and seeds, photo courtesy of Sarah’s Kitchen Gardens. Some garlics produce tiny bulbils the size of rice, which can take up to five seasons of planting an growing before they produce mature garlic that is full-sized and has differentiated cloves. Your mileage when growing garlic from bulbils will vary greatly depending on the type of garlic and local conditions, but generally the first growing season for a bulbil will produce a round, which is larger than the original bulbil you planted but still very small and lacking differentiated cloves. Plant the round the next fall and you’re likely to get a small bulb the next season that lacks cloves, or a small bulb with just a few cloves. Eventually — usually after 3-5 years — the above process will produce full-sized, mature garlic plants from the bulbils that were originally harvested and planted. Why Grow Garlic from Bulbils? If all this sounds like a lot of work, it is, especially compared to planting cloves, which will give you full-sized mature garlic plants in just one season. The big advantage — and the primary reason why people grow garlic from bulbils — is that you can greatly expand your planting stock at a fraction of the usual cost. Some types of garlic plants will produce a hundred or more bulbils each season. For garlics with relatively few cloves (such as Porcelains), growing plants from bulbils can save you thousands of dollars over time as otherwise you’d have to buy far more seed stock to grow out and expand your crop. Growing from bulbils doesn’t involve and special equipment or extra cost — just a lot of patience and planning due to the fact that it takes years for bulbils to produce mature garlic plants. 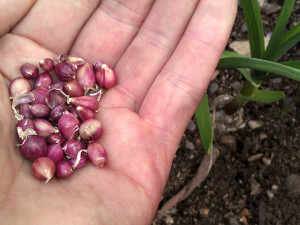 Harvesting bulbils to plant will require leaving scapes on plants to develop, which in some cases can stunt the growth of the bulb of the plant involved. Most growers that harvest and grow from bulbils only set aside a portion of plants that they harvest bulbils from, letting them remove scapes from others to maximize the bulb size while still collecting enough bulbils for their planting needs. If want to get mature garlic as quickly as possible from the bulbils you collect and plant, Rocambole garlics will usually be your best bet. They form a small number of very large bulbils each year, with some growers getting fully mature plants from Rocmabole bulbils in as little as two years. If you’re more patient and looking for a bigger eventual payout, Porcelain garlics will likely be your best bet. Some varieties will produce 100+ bulbils, so a relatively few number of Porcelan garlic plants can produce 1000+ mature plants within 4 to 5 years.